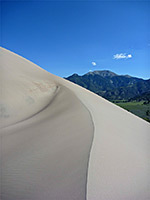 There is plenty of sandy desert in Arizona and California, but nothing quite like the Great Sand Dunes of Colorado. Seeming totally out of place at the edge of the snow-covered Rocky Mountains, these dunes of pure golden sand cover an area about 7 by 5 miles and reach heights of 700 feet above the floor of the flat San Luis Valley, making them the tallest dunes in the USA. The valley, the floor of which is over 7,500 feet in elevation at this point, extends for over 100 miles south into New Mexico and is bordered by the San Juan Mountains to the west and the lower Sangre de Cristo range to the east, hills which mark the edge of the Rockies and continue southwards towards Santa Fe. The valley is also notable for having some of the longest stretches of straight road in the US, including a 35 mile section of CO 285 between Monte Vista and Saguache. On November 22nd, 2000, Great Sand Dunes National Monument was officially upgraded in status, and after several years of finalization of the purchase of adjoining ranchland it is now known as Great Sand Dunes National Park and Preserve. An additional 110,000 acres has been added, some of which was previously part of the Rio Grande National Forest, and the changes also included creation of the Baca National Wildlife Refuge that now occupies another large empty area of the valley, just west of the national park. The dunes are visible from some distance across the flat valley floor. There are two approach roads; west from Mosca along country road 6N, or from the south along CO 150, both of which pass through a rather dull landscape of flat dusty farmland with scattered settlements. Past the entrance station, the first site is a visitor center, after which the main road leads to a campground, where an unpaved 4WD route (the Medano Pass Jeep Trail) continues - this runs due north for a few miles between the dunes and the hills, climbs to 9,900 feet as it crosses the mountains and eventually meets state road 69 at the small settlement of Bradford. The first mile is suitable for all vehicles, as far as a small carpark at the edge of the forest (a place known as 'Point of No Return'), but beyond here the surface is mostly soft sand. 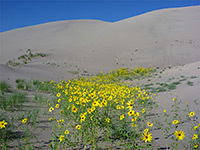 Camping is also allowed at several backcountry sites and among the dunes themselves, but away from the edge. 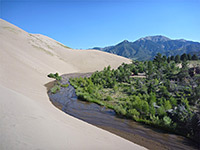 PDF format map of Great Sand Dunes National Park, from the National Park Service (1.6 mb). 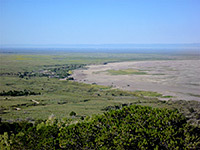 The dunes were formed from sand deposited by the Rio Grande and its tributaries, which flow through the adjacent San Luis Valley. 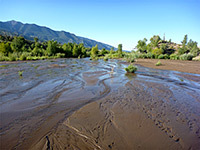 For thousands of years, prevailing westerly winds have blown over the Rockies and down over the river flood plain, picking up sand particles on the way. These are then deposited at the east edge of the valley before the wind rises to cross the Sangre de Cristo mountains. The process continues and the dunes are still being gradually enlarged by the wind, which also changes the shape and sand patterns of the dunes daily. In some places, patches of black sand are found caused by deposits of magnetite, a crystalline black oxide of iron. This is one place where footprints are definitely not a problem, unlike many desert parks of the Southwest where the delicate sandy soil is easily damaged by visitors. Just after the visitor center, a short spur road leads to the main access point to the park. There are no roads or official trails into the dunes and so because of the soft, ever-shifting sand, possibilities for exploration are limited. However, it is permitted to walk anywhere and one popular target is the top of the tallest dune, which conveniently is only half a mile from the edge. Still, the journey takes up to one hour and it is often a case of one step up, half a step down. It is easier to walk along sand ridges, rather than up the side of the dunes. The surface temperature of the sand can rise to over 140 F, much too hot for barefoot walking. It is also advisable to carry water and watch out for lightning in the summer. The dunes are a great place for children and the park can get very crowded in summer but a more tranquil experience awaits those to willing to walk a little further into the sandy landscape. The six maintained trails in the park explore the wooded slopes east of the dunes, visiting a mountain pass, two elevated viewpoints, several high country lakes, and the corridor between the forest and the sands. Another amazing feature of the Great Sand Dunes is Medano Creek - a small stream fed by melting snow that is only about ten miles long and flows most strongly during spring and early summer. 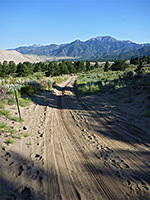 It starts in the Sangre de Cristo mountains, runs along the east edge of the dunes and disappears below ground in the valley, in common with many other such streams in this area. For several hundred yards, the creek flows across a flat sandy area many meters wide. The clear, warm water constantly changes course and intensity and moves in babbling wave-like ripples across the sand. One can be standing in a fast-moving current over a foot deep and then suddenly the water will stop and flow instead several meters away. Sometimes the sand is washed into small dams which then break causing periodic waves of stronger intensity to be released. In summer the amount of water is less, and the section of creekbed at the main visitor area is usually dry, but if so the creek can still be seen by walking upstream, half a mile or so. Steady climb up a wooded valley; best for wildflowers rather than scenery since apart from short stretches near the start, the views are quite restricted. Path alongside the dunes, close to Medano Creek. The sands are explorable by off-trail hiking.